Individual public or private, nonprofit Alaska Native-serving and Native Hawaiian-serving institutions of higher education that meet the definitions of Alaska Native-Serving Institution or Native Hawaiian-Serving Institution established in Title III, Part A of the Higher Education Act of 1965, as amended (20 U.S.C. 1059d.) are eligible institutions under this program. See RFA for further information. The Health Resources And Services Administration (HRSA), The Centers for Disease Control and Prevention (CDC), and CityMatCH are offering a Training Course In MCH Epidemiology as part of their ongoing effort to enhance the analytic capacity of state and local health agencies. The training course is an intensive program, combining lectures, discussion, hands-on exercises, and opportunities for individualized technical assistance. Several post-training webinars will serve to build upon and extend the content of the in-person training. This national program is aimed primarily at professionals in state and local health agencies who have significant responsibility for collecting, processing, analyzing, and reporting Maternal And Child Health data. This year, the course is geared to individuals with Intermediate to Advanced skills in statistical and epidemiologic methods, preferably in MCH or a related field. Note: Only applicants who work domestically and regularly analyze data rather than manage programs, will be considered. If you have Basic to Intermediate skills (mostly generate descriptive statistics with limited application of regression analysis), we welcome you to apply to next year’s course, and to review the online archived course materials from the 2017 basic to intermediate course. If you are a program manager, please see the training links below for data users. Training will begin mid-day Monday, June 25 and conclude mid-day Friday, June 29. Hotel room lodging is included in the training. A limited number of scholarships for airfare are available. Applications will be competitively reviewed, and acceptance notifications issued by late March. Completed applications must be submitted online for competitive review by 11:59 pm PST, February 23, 2018. No late applications will be accepted. 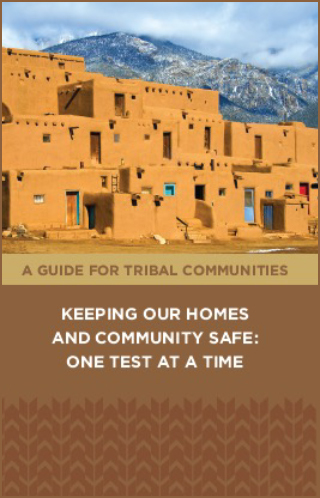 To help address indoor radon concerns and to establish a baseline of general housing conditions, two northern pueblo communities partnered with the Albuquerque Area Southwest Tribal Epidemiology Center (AASTEC) located in Albuquerque, New Mexico. AASTEC epidemiologists collaborated with the health and community services, Indian Health Service Environmental Health Department, health boards, environmental services departments, one housing authority, and the community health representative (CHR) programs in both pueblo communities to help develop an extensive spatial database. We geospatially mapped homes, measured their indoor radon concentrations, and recorded general housing conditions. Prior to the Tribal Healthy Homes Project, each community expressed a desire to apply for environmental health grants. However, existing data were limited on indoor radon measurement as well as current housing conditions. Therefore, this project provided an ideal opportunity for each community to customize and develop a survey of housing attributes and indoor air quality levels; with the end result of an indoor radon dataset as well as in-depth home assessments. As part of the tribal environmental public health tracking program, we facilitated and provided the following services in collaboration with both pueblo communities. First, we participated in determining and prioritizing the health priorities for the overall project. Second, using the established environmental health priority list, we assisted in the development of a customized home assessment data dictionary tailored for conducting home assessments. Third, we provided pilot funds whereby both communities were able to: a) attend a geographical information system (GIS) training at a local tribal community college and b) purchase indoor radon kits and GPS handheld equipment, including essential software licenses. Both communities chose to use a Trimble® handheld device because it is compatible with software capable of easily recording and storing data using the customized home assessment dictionary developed by both tribal communities. The fundamental advantage of using a handheld GPS device lies in its ability to spatially record the location of each home and to record certain housing characteristics, respectively. Fourth, we assisted in developing culturally specific radon brochures for both communities. Lastly, we assisted in training exercises on how to conduct home assessments, how to measure home indoor radon concentration levels, and how to assess homes for fall injury risk factors using an injury prevention checklist. The project yielded immediate and long-term impacts in both tribal communities. First, members in each community had the option to expand their technical skillset by learning how to appropriately use a geographical information system database and associated hardware. Prior to the project, some members were beginners and others were more advanced in utilizing GIS software and hardware. Second, both communities spatially mapped and assessed selected homes in their communities. Sample size was based on the population of each tribal community and at the end of the pilot project funding period, each community mapped and assessed nearly half of the homes in their communities. Third, each community was able to attain updated indoor radon concentration measurements picocuries per liter (pCi/L) for both public and residential buildings. As a result, each community is now able to target follow-up testing with homes and buildings with observed higher indoor radon levels above 4.0 pCi/L, the action limit set forth by the Environmental Protection Agency. Fourth, each community was able to capture and record critical housing characteristics including the demographic make-up of residents within each home. For example, the housing department was interested in the number of operating detectors in the home, e.g., smoke and carbon monoxide; the clinical services department was interested in identifying where at-risk populations live within the community, such as children who may have asthma or elderly who require accessibility and mobility assistance. Long-term impacts of the project include just a few of the following benefits. First, providing opportunities to develop advanced training in utilizing GIS software and hardware will aid in tribal capacity surrounding GIS usage. Second, each community will have spatially mapped homes in their communities, including housing characteristics, recorded as part of the home assessment. Such a map could provide a very powerful tool in prioritizing funds for home repairs, mitigation, and outreach to assist children and elderly in cases of emergencies. 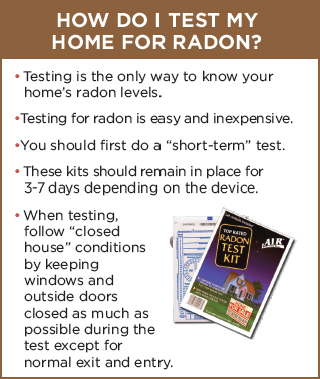 Last, homes retested for indoor radon concentration levels observed to be above the action limit could be targeted for home mitigation to reduce indoor radon levels below the action limit. One community is actively querying and utilizing their database to quantify the number of homes with elevated indoor radon levels and the number of home repairs needed to assist at risk populations in their community. This project highlights and illustrates impacts of environmental health in several ways. First, the promotion of a healthier environment is a direct impact of the pilot project. By assessing homes for indoor radon levels as well as for housing conditions, tribal housing departments in both communities have information: to target home repairs, to apply for mitigation funds, and to encourage homeowners with potentially elevated indoor radon levels to retest their homes. Second, the availability of a map of geo-located homes along with their respective housing conditions and demographic make-up, would undoubtedly prove useful for public health workers in prioritizing resources in cases of emergencies. Last, the Tribal Healthy Homes project can be used to inform homeowners in both communities on how to create healthier homes to reduce unintentional injuries related to fall risk factors, such as lack of handrails for elderly, or the long-term health effects associated with elevated indoor radon levels. Big Data in Healthcare: Exploring Emerging Roles (February 5, 2018 to March 30, 2018): This course will help health sciences librarians better understand the issues of big data in clinical outcomes and what roles health sciences librarians can take on in this service area. Beyond an Apple a Day: Providing Consumer Health Information at Your Library (February 6, 2018 to March 13, 2018): This hands-on class will cover the health information seeking behavior of consumers and the role of the librarian in the provision of health information for the public. Come learn about the evolution of consumer health, health literacy and the e-patient. Participants will be equipped with knowledge of top consumer health sites, e-patient resources and collection development core lists. Learning to Liaise with Health Professions (February 7, 2018, 2:00PM – 3:30PM ET): Attendees will explore various health professions and educational environments, such as community colleges, hospitals, universities, and more. Next, the course will focus on how educational standards for health professions inform library instruction, research support, and collection services. Grants and Proposal Writing (February 15, 2018, 2:00PM – 3:00PM ET): Designed for beginning grant proposal writers, this class presents a general overview of the grant and funding processes as well as the level of detail required in a successful proposal. Healthy Aging at Your Library: Connecting Older Adults to Health Information (February 22, 2018, 11:00AM – 1:00PM ET): This “train the trainer” class is designed to help librarians assist their older adult patrons find health information. Discover techniques for teaching older adults to use computers and to find health information on the Internet, learn what makes a website senior-friendly; plan library programs on senior health topics; and find out about some recommended health websites for older adults. Whether the origins of the phrase Speaking Truth to Power are an American Friends Service Committee’s 1955 pamphlet on nonviolence, a Quaker saying from the 18th Century, writings by civil rights leader Bayard Rustin, a speech by ACLU president Patrick Malin, or even plays by Sophocles or Shakespeare, it has been used by social justice activists, clergy, academics, journalists, politicians, and evaluators to describe taking a stand, speaking out. Join your evaluation colleagues in a lively, critical conversation about the role of evaluators and evaluation in Speaking Truth to Power.